The media frenzy over the Stop Online Piracy Act and the Protect IP Act (SOPA and PIPA respectively) appears to be finally dying down after last week’s Internet blackout, mostly due to the shocking news regarding the shutting down of Megaupload. While I publicly expressed some misgivings about the focus of the current debate, it is undeniable that with regards to SOPA and PIPA, there is indeed room for concern outside of the U.S about the two pieces of legislation (not to mention concern inside that country), as it is very possible that SOPA and PIPA could have serious extraterritorial consequences. This has been a point that has been constantly repeated in the last few days, but the danger is much graver than anyone thinks. See, the existing network architecture of the Internet relies heavily on the United States, and any legislation that affects the core would have cascading consequences elsewhere. Allow me to elaborate. This is just one aspect of the large dominance that the U.S. has in the Internet’s infrastructure. Things get even more interesting when you look at the logical architecture, where the U.S. has managed to remain considerably ahead of other countries. While anyone can become an Internet server by just installing web server software into any computer connected to the Web, you need a registrar if you want a domain name that resolves in the system (such as technollama.co.uk). Most top level domains are registered in the United States (.com, .org, .net, .biz), and statistics show that the U.S. is the country with the most domain names registered under its jurisdiction, with 78,453,258 as of last week. The closest second country is Germany with over six million. In fact, not even combining the rest of the countries can you reach the total of domains registered in the U.S. A similar picture emerges with regards to hosting, that is, where content is actually placed in a server. For example, while this blog’s domain name was registered by a UK provider, it is hosted by a U.S. company (and I assume that the content is actually held there). 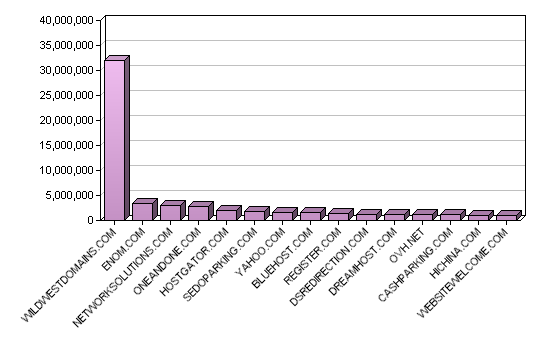 9 out of the top 10 hosting companies are American, and of these, the largest host in the world is GoDaddy (WildWestDomains in the chart). The end result is a skewed map of the world, where whatever happens in the United States affects the Internet disproportionately. Take what happened to Megaupload, while the company was registered in Hong Kong, and most of its operations ran from New Zealand, its .com domain was registered to an American company named DotRegistrar, based in Washington state. Similarly, the site had also hired some of its hosting services in the States, where at some point it had leased more than 1,000 servers to companies like Carpathia Hosting and Cogent Communications. This state of affairs opened up Megaupload to enforcement by American authorities, which is precisely what took place. This would have established a filtering responsibility for ISPs and other intermediaries against alleged copyright infringers. The problem with such a feature when introduced in such a central country is that it could perfectly trickle downstream to other physical and logical clients elsewhere, which would mean that SOPA would be used to filter content to all of us. There are already lots of national filtering systems enacted in countries around the world, but none of these is as central to the workings of the Net as the Land of the Free™. Seen from an architectural perspective, countries like China are large Intranets, which is why it was so easy for Egyptian authorities to shut down all Web access during that country’s revolution. The U.S has an entirely different role to the network, so anything that is filtered there could end up being filtered in places that have never heard of SOPA, be it justified or not. I cannot imagine that this is a bug and not a feature, some in the copyright industries seem determined to export this draconian model.